The fungi with gills all have this characteristic in commonthat they bear their spores on radiating plates or lamellae. 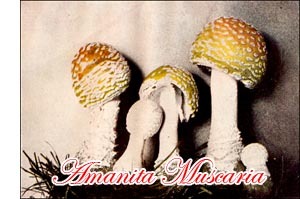 Their family name, Agaricaceae, is derived from a typical member of the family, Agaricus campestris. The family is the largest and most widely distributed of all the families, and contains some five thousand described species, which are placed in groups or genera, more or less large, based on such characters as the colour of tile spores; the position and shape of the lamellae; the colour and texture, as well as the shape, odour, taste, and appendages of the cap and stem. The colour of the spores is one of the most important characteristics, as the decision as to whether the plant is wholesome or not often rests upon it. The colour may be determined by placing the cap, with spore surface down, on a sheet of white or black paper, and leaving it for a time tinder an inverted glass, so as to cut off all drafts which may blow the spores away. A print of the radiating gills will then be made in the colour of the spores - white, pink, rusty brown, or black. For external characters of the stein, one must be careful to get the entire stein from the ground; for a most important characteristic, the volva, if present, will be found at the base. The volva may be membranous and attached to the base, excepting at the rim, or membranous and loose, or present only in the form of rings of scales at the base, with perhaps traces on the surface of the cap. The surface of the stem may be smooth or rusty or mealy white. It may or may not have near the cap a ring of the membrane which covered the gills of the young plant. The character of the lamellae and the internal characters of the stem may best be determined by cutting the cap and stem from top to base with a sharp knife, for then it may be seen whether the gills are free from the stem or attached to it, or whether they grow down on the stem; and whether the stem is hollow, solid; or filled with web-like mycelium, and whether it is fleshy or has a tough and hard rind. The lamellae may be of different or of equal lengths, and their edges may be entire or toothed or thin or blunt.